Notes: Splendid cover in immaculate condition and very rare with having also been taken over to, and postmarked at Waterloo in Belgium. The above Royal Mail British Army stamps were issued on 06 July 1983 by Royal Mail and feature the following stamp designs: 16p Royal Scots; 20 1/2p Royal Welch Fusiliers; 26p Royal Green Jackets; 28p Irish Guards; 31p Parachute Regiment. 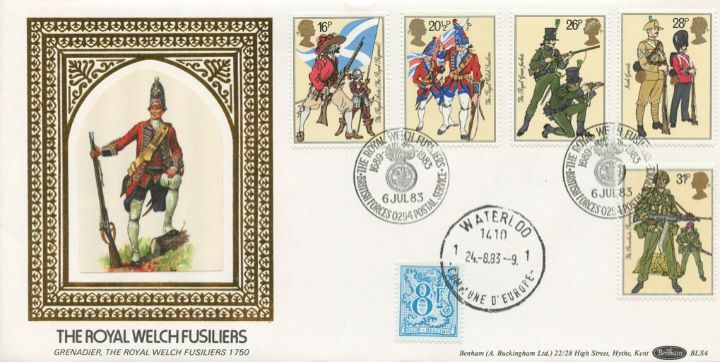 The Double-dated in Waterloo Belgium first day cover with the BFPS - Forces, Badge, Special Handstamp postmark has been produced by Benham and features these stamps which can make a very collectible and lovely gift.